The law and practice of court record access across United States jurisdictions is in a confused state. Public access to records in the hands of government, including court records, is a desirable norm of public policy; on this point, there is universal agreement. But there is disagreement on questions as fundamental as whether public access to court records is founded in constitutional law, or only in common law; and the extent to which court record access is the province of the courts or the legislature. And most importantly, there is widely divergent disagreement about what circumstances warrant restriction on public access to records. These disagreements and the attendant confusion in the law have been exacerbated in the electronic era, which has given rise to myriad concerns over access and privacy that are alien to the common law experience. The purposes of this Article are to review the development of court record access law from its common law origin through its confusing appearance in constitutional law in the company of its equally unsettled twin, courtroom access; to explicate the CCJ/COSCA Guidelines, developed to provide multi-jurisdictional guidance, and second, to provide a “legislative history” for, and an explication of, the Arkansas Proposed Order, with reference to its antecedents in common law, in the Guidelines, and in Arkansas FOI law; and to assess the extent to which the Proposed Order accords with and departs from critical FOI norms enshrined in the Arkansas FOIA, specifically with respect to seven issues we have identified as critical. 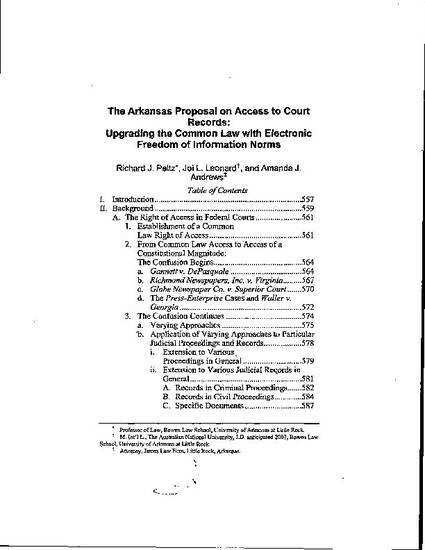 Richard J. Peltz, Joi L. Leonard, Amanda J. Andrews, The Arkansas Proposal on Access to Court Records: Upgrading the Common Law with Electronic Freedom of Information Norms, 59 Ark. L. Rev. 555 (2006).